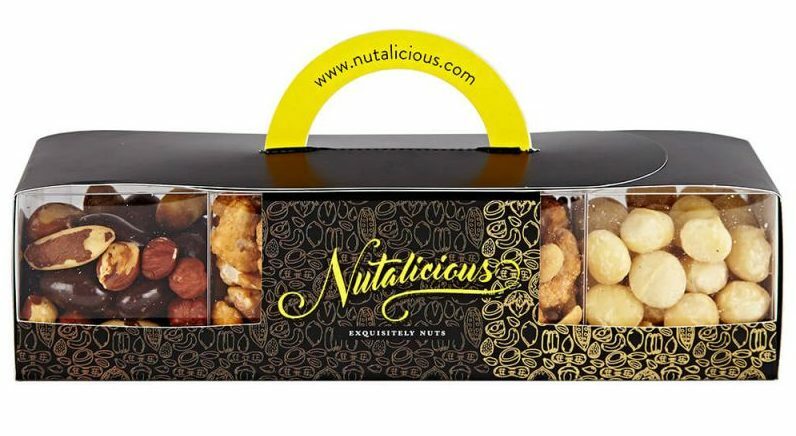 We are delighted to have been part of the creative concept for the packaging of Nutalicious.com and their unique range of dried fruit and nut collections. The York based company which provides a ‘choose your own’ variety pack of exquisite nut mixes required two packaging solutions to structurally adhere to the two sizes of their product offering, whilst being practical, transportable and showing off as much of the product itself. Taking Karen’s brief and ideas, we came up with a structural concept that was inventive and provided practical solutions for both the 4 pack and 8 pack healthy food collections. The packaging was constructed with the idea in mind that it should be easy to carry and walk with, which is where the handle formation came in. A clever self-assembly cross shape was constructed to house the 8 pack cube. With the contents being 8 individual clear boxes storing the nuts that conveniently stack into a larger cube, the cross shape of the packaging solution neatly fits round each individual box enough to secure the product together. One important consideration when deciding upon the board type and structure was the weight of the product. The eight box pack has a significant weight to it, and we had to be sure the solution we came up with held the product securely. The wrap around arms meet centrally at the top and interlock with the handle to further add strength. The four box pack works along the same principles as the eight box, but has two shorter arms to wrap around the rectangle shape of the four boxes. After testing the product and making appropriate adjustments, Karen supplied us with her artwork for the project to go into production. Our Priory Press studio came up with a concept that was self-assembly, which means no glue has been used in forming the packaging. Supplied flat to Nutalicious, they are able to quickly assemble as and when needed. Check out Nutalicious online here, and why not build your own nutty treat or surprise a friend with a selection of their tasty chewy treats! PreviousPrevious post:The Packaging Hunt is OverNextNext post:We Are Hiring!